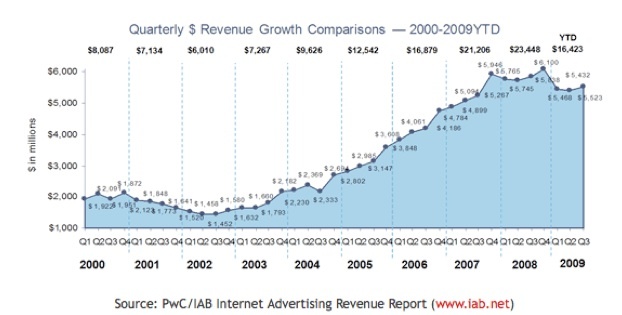 Online advertising revenues in the U.S. seem to be stabilizing. The Interactive Advertising Bureau (IAB) and PricewaterhouseCoopers released third-quarter figures showing that online advertising in the U.S. approached $5.5 billion, up 1.7 percent from the second quarter of 2009, but still down 5.4 percent from the same quarter a year ago (which is in line with the losses during the first half of the year). As you can see in the chart, there was a big drop-off after the fourth quarter of last year, and the first three quarters of this year have been flat. On a global basis, we might already be seeing a recovery, at least for search advertising. The online advertising revenues of the four largest Web advertising companies (Google, Yahoo, Microsoft, and AOL) increased 1.2 percent in the fourth quarter. Google accounted for all of that growth, however, so we are still waiting for display advertising to find its footing. It is likely that in the U.S. alone, search advertising is also leading the recovery. But now that Google is mixing more visual elements into search ads (are those display or search ads? ), perhaps display ads will see a boost as well.